Blind Runner Finishes 7 Marathons in 7 Days on 7 Continents! A blind British runner became only the third person ever to complete seven marathons on seven continents in seven days when he crossed the London Marathon's finish line on Sunday. Only 3rd person to ever do that! Mr Heeley and Mr Carr ran their first event in the Falkland Islands on 7 April, before travelling to Rio de Janeiro, Los Angles, Sydney, Dubai, Tunis and finally London, and have so far raised over �100,000 for the Guide Dogs charity. Mr Heeley said he was inspired to undertake the challenge by the "life-changing" event of receiving his first guide dog. 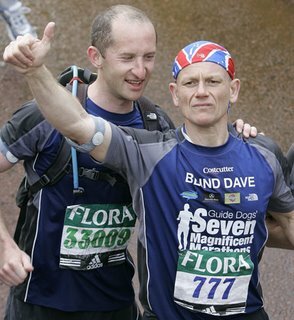 He hopes his world record will help other blind people to achieve "freedom and independence". Blind people throughout the entire world do every day things - just a little different from you or I. And then, there's Dave, who raised $'s for charity, by doing what he does best!